Date: Tuesday 24th April 2012. Other details will be put here once they are agreed. Where? The RAF Club? Other suggestions welcomed. If the date should change, perhaps CRS. Who can supply which vintages of Delaforce? JDAW: 1970 and 1977, subject to confirmation. JHG via JDAW: Corte 1974. AHB: 1963, 1977; Corte 1984. WS: 1966, 1970, 1977 (need to check); and Corte 1980 and 1987. AP: 1966, 1970, 1975, 1977, 1980, 1982, 1985, 1991, 1992, 1994, 1997, 2000, 2003 and 2007. [url=http://www.theportforum.com/viewtopic.php?p=43997#p43997]Here[/url] uncle tom wrote: Delaforce is the one to take forward IMO, with at least one, and preferably two members of the family in attendance..
'Delaforce, a celebration' might be the theme, at the RAF club perhaps (preferably upstairs..) and timed to suit the family..
[url=http://www.theportforum.com/viewtopic.php?p=44048#p44048]Here[/url] Axel P wrote: I very much would like to join a Delaforce tasting as well. I do have many Vintages from 66 and younger (I guess pretty much all of them), so how about this for a January tasting? Anybody volunteers for organising. I would book the club and get the VIP. [url=http://www.theportforum.com/viewtopic.php?p=39869#p39869]Here[/url], in January 2011, g-man wrote: I'd like to resurrect this tasting as I'm sending Julian back with a bottle of 1974 Delaforce to taste. 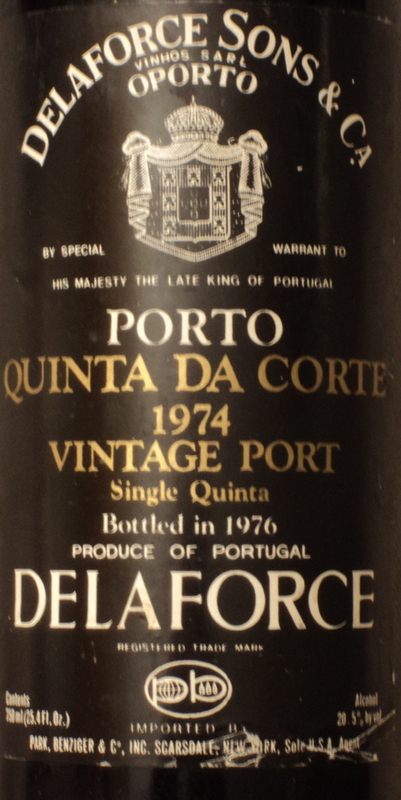 I have little to contribute to a Delaforce vertical - but I do have the Corte 1984 (otherwise only the 1977 or 1963). if possible I would like to join as well. With regads to Delaforce ports I think I have 66, 70 and 77 (need to check) and Corte from 80 and 87.
uncle tom wrote: Delaforce is the one to take forward IMO, with at least one, and preferably two members of the family in attendance.. Assuming Uncle Tom has an inside track to make this happen, should we be reserving two spaces for honoured guests? Updated to include ports from AHB, AP, WS; and the addition of two honoured guests. is there a location for said tasting? g-man wrote: is there a location for said tasting? [url=http://www.theportforum.com/viewtopic.php?p=43997#p43997]Here[/url] uncle tom wrote: 'Delaforce, a celebration' might be the theme, at the RAF club perhaps (preferably upstairs..) and timed to suit the family.. So the current plan is the Royal Air Force Club, 128 Piccadilly, London W1J 7PY. By private message THRA wrote: Delaforce vertical - would appreciate date set after about March 12th. The ‟about” complicates interpretation: absent contrary instruction, I declare this to mean on or after Monday 19th March 2012. When setting date, we should bear in mind that an early spring placeholder has also been reserved for Wolfgang's 1980 Horizontal in Leverkeusen. THRA is unlikely to go to Germany for a 1980, so, ideally, the Leverkusen event would be before mid-March. Ideally. I can also offer the 1992 VP. I just worked out I have a 1994 Delaforce I would be interested dependant on date as it is a relatively busy period. Should we be planning a date, particularly if people are willing to fly to attend? I am willing to fly to attend. Easter is not good due to holiday reasons. Easter Sunday is 8 April 2012. Other E&W public holidays include Mon 7 May, Mon 4 June, and a special for the Queen’s Diamond Jubilee, Tue 5 June. I'm a little late, but if there is a tentative list I could join, put me down. I don't know travel and work plans yet, but I typically try to get to the UK around April time. Julian, could I please ask you to set up a date for this as I could try to contact the industry guests if wanted by you? Axel P wrote: Julian, could I please ask you to set up a date for this as I could try to contact the industry guests if wanted by you? A Monday, Tuesday or Wednesday in late April. Â¿When works for the industry guests?